Ever thought of using that tooth pick to get perfect manicure? or that eye shadow sponge? or that masking tape? 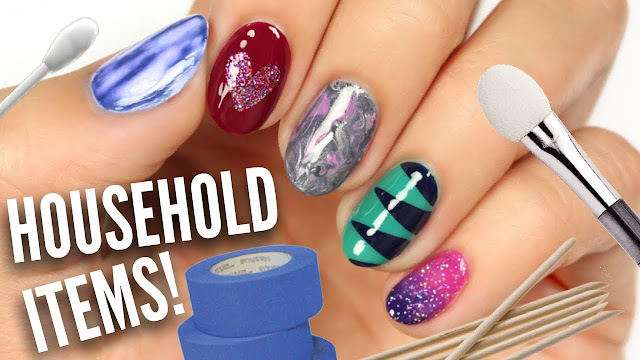 It might sound weird to some of you, but it is absolutely possible to get a creative nail art or manicure using these things and many others in your house. I did a blog on Nail art designs that you can make using various household items lying in your house previously, you can check it out. Today I am back with second blog. There are so many common household items which you can easily use to create great nail art designs without using expensive nail art tools. Here is a tutorial that will show you how to use different things lying in your house to get that perfect nail art you always wanted. Let's get started! Hope you loved it and will keep coming for more on my blog. New nail art trends, ideas, manicure tips and nail art tutorials are updated here regularly. Do not forget to Follow me on Facebook, Instagram and the blog website for regular updates.